Multipurpose is something that is always appreciated. That’s exactly what you will find with InnoGear Upgraded Solar Lights. These lights have a star rating of 4.1 on Amazon with positive reviews making up over 60% of 3,083 reviews. Here are few things that make this amazing lights. Let us first start with the main selling point of this lights. First, these lights are 2-in-1, which means that they can be spotlights or pathway lights. With an attachable spike, you can easily plant these lights on the ground along a path, but the spike can be removed for the lights to be mounted on the wall. The package includes anchors and screws in order to place the lights outside the house. With that said, these lights are the right size to include the 2-in-1 feature. They measure 7.1 by 7 by 9 inches and weigh 1.7 pounds. Therefore, you don’t have to worry about screws not being holding the lights strong enough since they are fairly light. 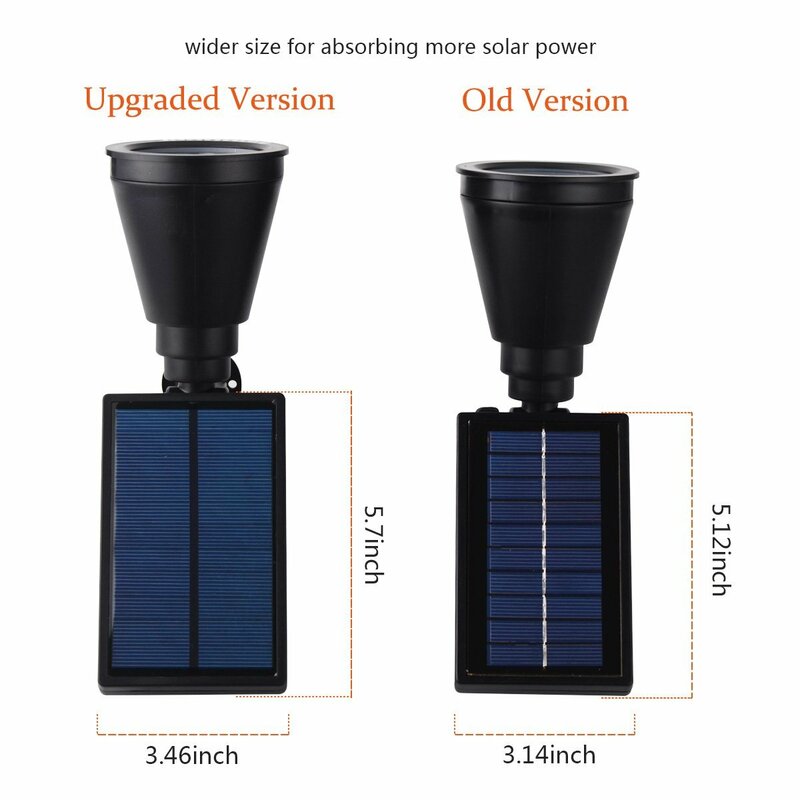 The body of InnoGear Upgraded Solar Lights is made from strong ABS plastic. The waterproof rating of the lights is IP65, so you don’t have to worry about these light being damaged by snow or rain. In addition, they are heatproof, to resist those hot summers since the light will be placed outside. Water or heat will not damage the solar panel, light, battery or other circuitry. 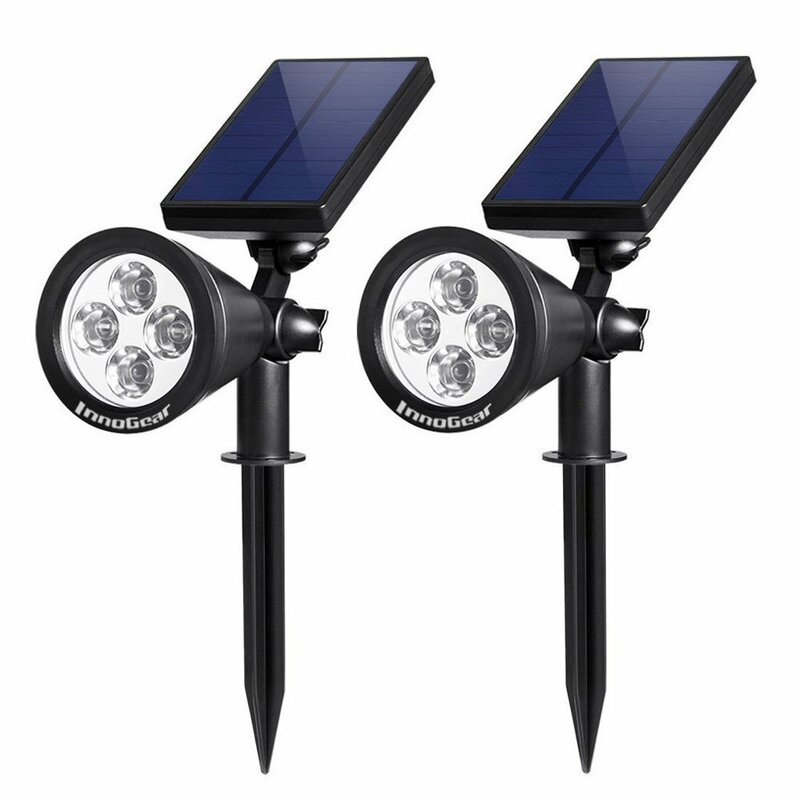 InnoGear Upgraded Solar Lights have 4 LED lights that output 50 lumens each. So, when combined, the combined total lumens is 200, which is very bright. As such, they give just the right amount of light for a path. The fixture also includes a 18650 lithium battery which is awesome and gives you access to constant light for almost the whole night. On their highest mode of brightness, the lights can last 4 to 6 hours assuming the previous day was sunny and nice. On the lowest mode, the lights should last 8 to 12 hours, which is anyway more than you need. Since these are solar light, you don’t need to plug in the battery anywhere. They will recharge themselves during the day. The solar panel on these lights gives 5.5V 1.5W. This is an amazing conversion for such a fixture. They are of course sensitive to weather and rainy days could affect their performance. These lights have many convenient and cool features. First, the lights are automatic. When the sun dims, the lights go off. So, you don’t need to switch them on or off. In addition, the lights have two brightness modes which can be switched on depending on your needs. Unfortunately, the lights don’t have a motion sensor which can trigger bright light when needed. The combined 200 lumen output is very bright. This allows for plenty of light when you need it. The battery is also big. The light can last for 4 to 6 hours on the 2200mAh battery. This is enough for the whole night. It the lights are on low brightness mode, it can last 8 to 12 hours. The solar panel is also adjustable. This means that you can adjust it for optimal solar absorption during the day. The lights have no motion sensor; therefore, you are stuck with either full brightness or low brightness all night. However, each lighting mode is best for its function. Full light works best for wall mount spotlight whereas low brightness works best for an accenting pathway. 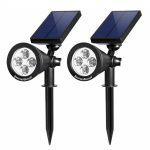 Although the lack of motion sensors force you to deal with very bright or dim light, these are still good quality outdoor solar lights. When you consider the fact that you can use these light as either a wall mounted spotlight or a pathway light, it makes them really awesome lights. In addition, you get two of these lights; therefore, you have double the possibilities. These are certainly the best lights you can get for lighting up a pathway, garden or above a door. These are amazing lights to have in your home. 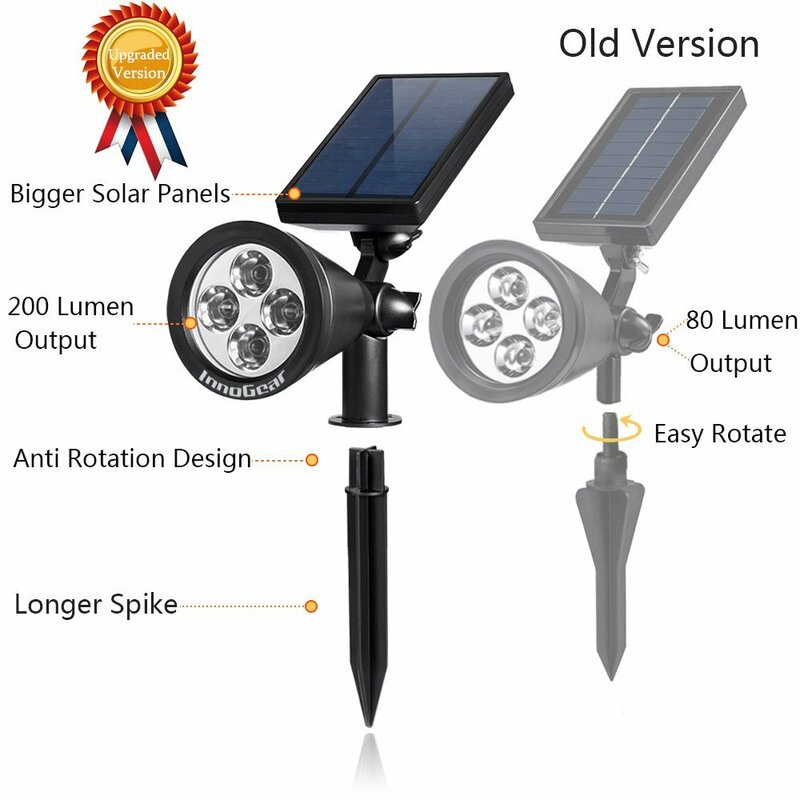 I had been looking for a spotlights that I can place on my house, but I always steered away from solar lights but I always thought that they wouldn’t be bright enough. But when I came across these lights, I had to try them after reading reviews. This is my first five start review for a product I bought on Amazon. I bought two of these lights and they are amazing and bright for the amount they are sold. They look professional and save you a lot of money on electricity bills. I was actually thinking of buying more of these lights that I can use to light up my back yard. I like the fact that these lights operate on solar, which means that I’m able to save on electricity bills and still light my back yard. I also like that they come at an affordable price considering the fact that they use renewable energy from the sun.